In 2012 pharmaceutical companies, donors, endemic countries and non-government organisations came together to sign the London Declaration on Neglected Tropical Diseases (NTDs) in support of the WHO Roadmap on NTDs. This public-private partnership has seen an unprecedented drug donation programme, delivered through innovative and community-based platforms that resulted in over one billion at-risk people reached with preventive medicines in 2016 alone; and set a world record for the most drugs donated in a 24-hour period. Today marks another milestone in this journey to rid the world of debilitating, but preventable, diseases and in ensuring we leave no one behind. The pharmaceutical company Pfizer – through the International Trachoma Initiative – has recommitted its pledge to eliminate the leading cause of infectious blindness in the world, trachoma, by extending its donation of the preventive drug Zithromax® (azithromycin) to all those at risk through to 2025. This generous announcement comes just weeks after the World Health Assembly approved its 13th General Programme of Work, which sets out an ambitious target to eliminate at least one NTD in 30 additional countries between 2019-2023. 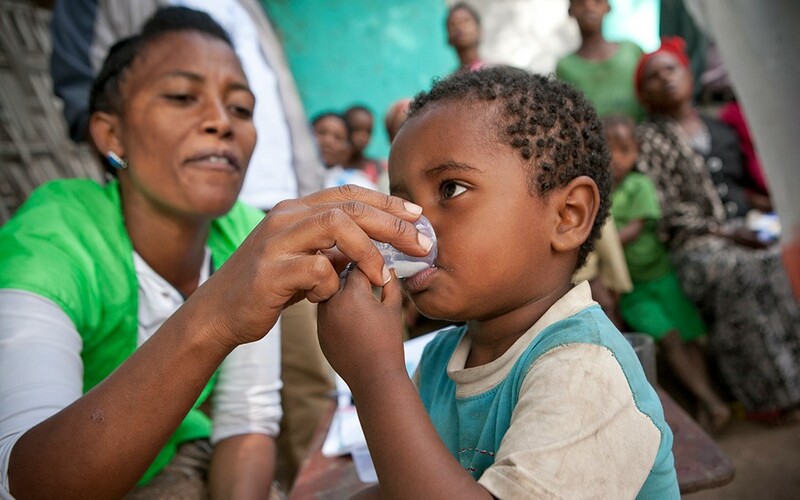 Pfizer’s commitment is the backbone behind the success for the elimination of trachoma and is to be celebrated. However, drugs alone cannot achieve the goals. They need to be delivered to the people who need them most; the poorest of the poor, who live in the hardest to reach, most marginalised communities, and women and girls who bear the highest burden of infection. No one must be left behind. DFID and USAID joined forces as the two largest donors supporting implementation of NTD programs to help NGOs and domestic governments in the delivery of donated drugs. In 2017, DFID provided over 27 million treatments to those at risk of trachoma, and have recommitted their support through a £20 million pledge over the next two years. The success of these programs is evident with USAID-supported countries on track to reduce the number of people at risk by 186 million and many countries eliminating NTDs. Six countries have eliminated trachoma as a public health problem, with Nepal being the latest country validated by WHO in May 2018, and Ghana close to being validated by WHO. Ghana will be the first country in Sub-Saharan Africa to achieve this milestone. However, even with these generous commitments and the achievements made to date, there is a need for new partners to join this fight. There are 500 million people still being left behind. We call on new and existing partners to contribute an additional $250 million per year needed to reach the unreached with much needed treatment. The Global Trachoma Mapping Project, which ended in 2016, and the largest infectious disease survey ever undertaken, helped to pinpoint accurately the areas at risk. This DFID-USAID co-funded project, in collaboration with 53 partners, enables governments to focus their interventions and adds to the value for money of what is recognised as a best buy in public health. NTDs are explicitly mentioned in the Sustainable Development Goals, and the World Health Organization proposed that ending NTDs could be the litmus test for Universal Health Coverage, meaning this new commitment by Pfizer is a step towards achieving both UHC and a key indicator in the 2030 Agenda.